The living example of the rich cultural heritage of Gujarat, Ahmedabad is a beautiful place that fascinates travellers from all over the world. The city is quite popular as “Amdavad” among the denizens of the city. Ahmedabad or Amdavad is located on the banks of placid water body of Sabarmati River. Famous tourist attractions such as Ashaval and Karnavati are still present till date in which one can see the influence of several dynasties. This heritage richness can be witnessed during Gujarat tours. When it comes to Budget hotel, you would like to consider hotel shahi palace in Ahmedabad. Situated opposite Vastrapur Lake this hotel has huge number tourist and is an ideal place for both business as well as leisure guests. 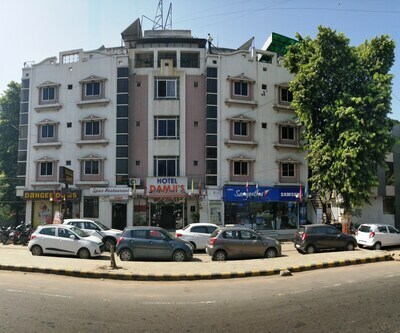 Patrons can reach this hotel from Ahmedabad Junction which is located at a distance of 11 km from the city. Sardar Vallabhbhai Patel International Airport is located at a distance of 16 km from the hotel. Tourists can enjoy various attractions near the hotel such as ISKCON Temple (4 km), Science City (7 km) and Sidi Saiyad Masjid (7 km) and many more. Then there is hotel shailly inn, mostly popular among the people from business background. The hotel is situated in a posh locality with an easy to access to office or business centers. Under the budget hotel you can also opt for hotel rudra regency, The hotel has delicious food facility and an excellent room services. While checking in or checking out you may need the valid Govt. Id proof. The liquor the hotel is prohibited. The hotel is located at a walking distance of Jaipur Railway Station. Sardar Vallabhbhai Patel International Airport is located 9km from the hotel. Guests can visit places such as Hathisingh Temple, Sabarmati Ashram and Manek Chowk which are located closely to the hotel. Another Budget hotel is Treebo Rajdeep Inn. It is merely 2 km away from Iscon temple. The rooms in these hotels are well equipped with standard amenities like Air conditioning, water heating LCD television etc. For all those who stay in this hotel has easy access to the Titanium city Centre for brand shopping and exploring food options. Is there unmarried couples are allowed with valid gov. id ? Both of u should have govt id with adress proof. Does super deluxe room include ac in hotel heritage ahmdabad?? Can I check-in at 6:00 AM .Will you charge extra? If yes, how much? Yes you can. there would be no extra charge for early check in.if rooms are available at that time. How far Hotel Silver Plaza from Gujarat college.? Very near hardly 500 metres. Are ATMs available near the Hotel Rudra Mahal Ahmedabad? Suggest me good budget hotels in ahmedabad near Ashram Road? Rudra Royale Hotel,Hotel Crystal,Hotel Kanchan Palace and Hotel Ashray Inn are best hotels near ashram road.